If you search Steam for nothing and then sort nothing by user reviews you'll get a neat list of the most popular games on Steam among user reviewers, based on the percentage of positive reviews on the system. 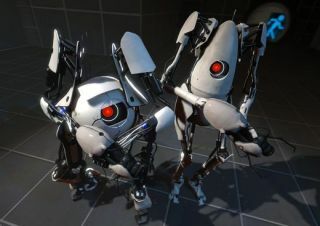 Portal 2 wins. Of 35,550 reviewers, 99% like the game. Make more games please, Valve. If you prefer raw numbers, Dota 2 (94% of 280k users like it) and Team Fortress 2 (97% of 200k like it) come out ahead. Skyrim also does well. 98% of 78,842 users like Skyrim. One Finger Death Punch, Crypt of the Necrodancer and Nuclear Throne have 99% positive ratings too, which is good, because those games are totally ace. In fact, the whole list is a brilliant resource if you're looking for ways to spend your spare Steam wallet pennies in the Steam sale. Here's a shot of the top ten. What do you think?